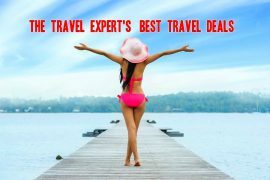 In my best travel deals this week I have lots of last minute holidays, Christmas market breaks from €199, a family ski holiday, a luxury holiday to South Africa, a wine cruise around the Caribbean and early booking offers to Orlando and Fuerteventura. Take your pick from last minute holidays from Sunway with prices from €354 to the Algarve, €384 to the Canary Islands and €434 to Sorrento. All prices include flights, accommodation, transfers and checked baggage for seven nights. The best thing about a city break in the winter time are the Christmas markets! Click&Go have a wide selection available including a three night stay in Prague from €199. This includes flights with Aer Lingus and a three night stay in the highly rated four star Theatrino hotel on a bed & breakfast basis. Bring the kids skiing to France in January. Stay at the highly rated Constellation apartments which provide door step skiing, for only €1259 based on 2 adults and 2 children sharing. Price includes flights, transfers and apartment for seven nights. Treat yourself to a luxury trip to South Africa. Explore Cape Town, the winelands and finish it off with a 5 star safari, all from €2399 per person, including all flights and car hire. For the masses who commented on my facebook page about the wine cruise – I found it  Cruise the Caribbean on the luxurious Norwegian Escape! Meet wine makers and experts and of course have plenty of opportunity to sample some world class wines. Price for flights, a two night stay in Miami and a seven night cruise on a premium all-inclusive basis, with all meals, drinks and gratuities included is only €1899! Beat the winter blues by enjoying some winter sunshine in Fuerteventura. Stay at the popular Broncemar Beach apartments for only €289 or go all-inclusive in the highly rated Labranda Aloe Club Resort for only €499. Prices include flights and accommodation for seven nights, based on 2 sharing. There are some amazing deals to Orlando for next Summer for anyone who is thinking of booking now. Check out this deal for two weeks in June, staying in the popular Avanti Hotel on International Drive for only €2833, based on 2 adults and 2 children sharing. Price includes flights, checked baggage, hotel and private transfers for fourteen nights. Use my promo code TRAVELEXP10 to save a further €100, and the best part – you only need €100 per person to secure a booking! Next articleTransatlantic Luxury Cruise to New York And 3 Nights in Fitzpatricks Hotel, €1579!